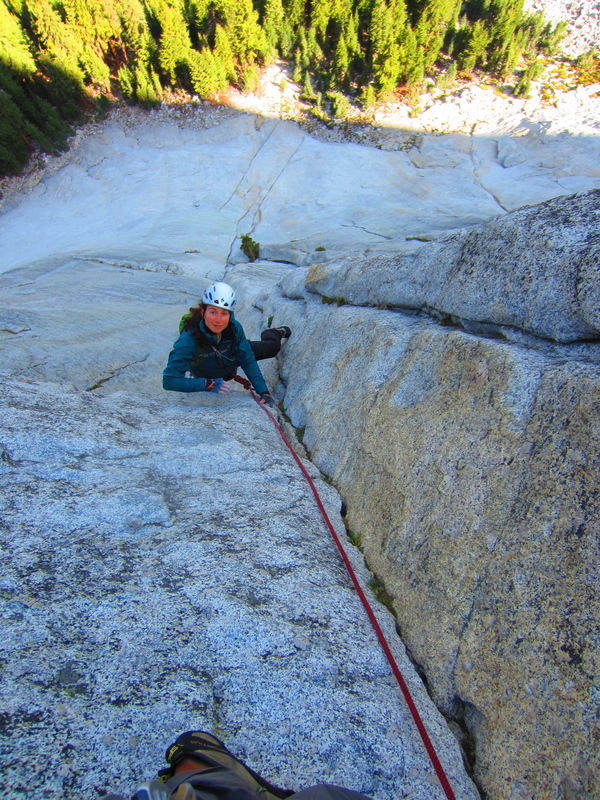 It’s an ever more widely acknowledged fact that if you’re a climber, Squamish is the best place to be in North America during the summer months. I was regretting having ever left as I poured with sweat and strained, teary-eyed through the smoke from the nearby Yosemite Rim fire. Thankfully we soon located the Trader Joe’s amongst the sweltering and smoke-filled strip malls of Reno and, after loading up on dried fruit and boil-in-a-bag curries, our little Californian vacation didn’t seem like such a bad idea after all. 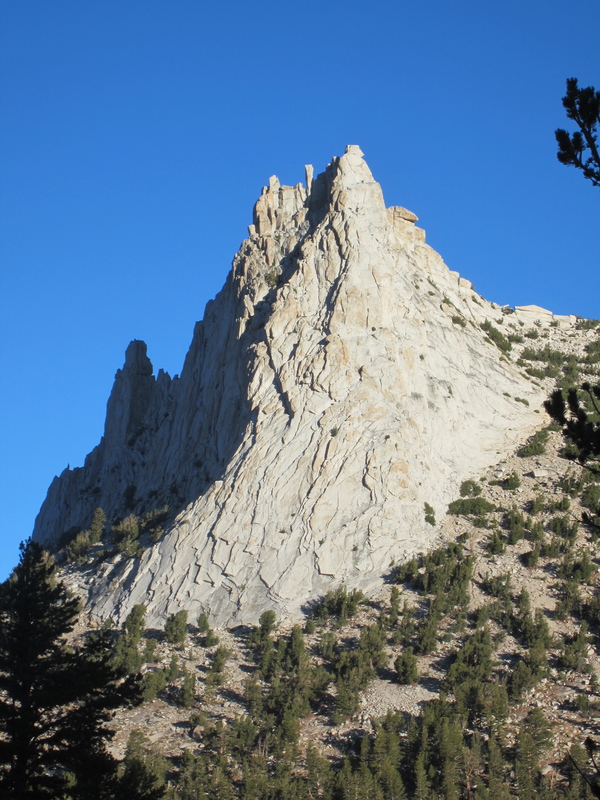 Cathedral Peak with its broad Southeast Buttress in the sun. Karina is first and foremost a rock climber. She likes low-stress climbing on good rock, preferably in the sun. I may be growing ever softer, but I still like to pretend that I’m an alpinist. This means walking long distances to climb poor rock in often miserable weather in the hopes of standing on a pointy summit. Since the Sierra are home to pointy summits as well as solid rock and great weather, it was a roadtrip destination we could both agree on. Karina arriving at the summit of Cathedral Peak. Our first stop was Tuolumne Meadows. 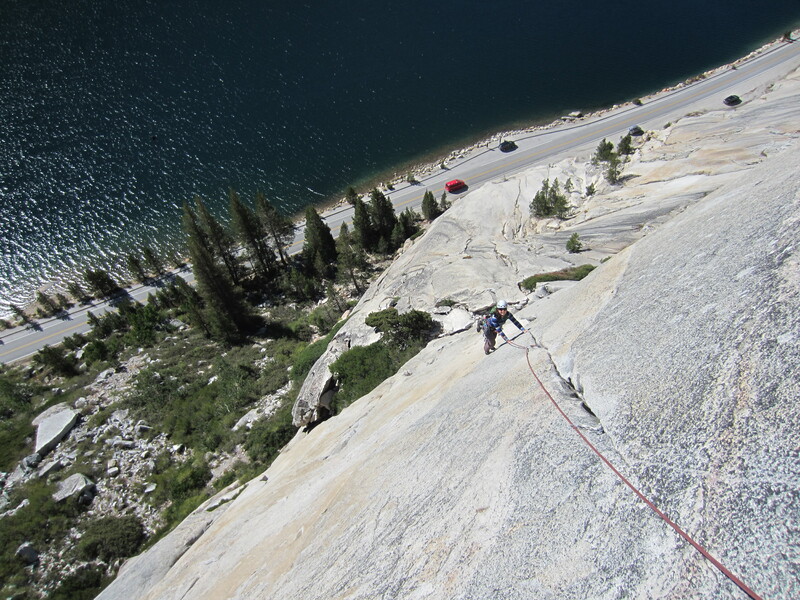 In spite of having spent a great deal of time in Yosemite Valley, I’d never actually climbed in nearby Tuolumne. The Meadows turned out to be a perfect introduction to the Sierra with short approaches, great rock and a relatively gentle topography. The obligatory Eichorn’s Pinnacle shot. We climbed a classic moderate route every day for nearly a week until the winds changed and the smoke pouring in from the Yosemite Rim fire became too much. 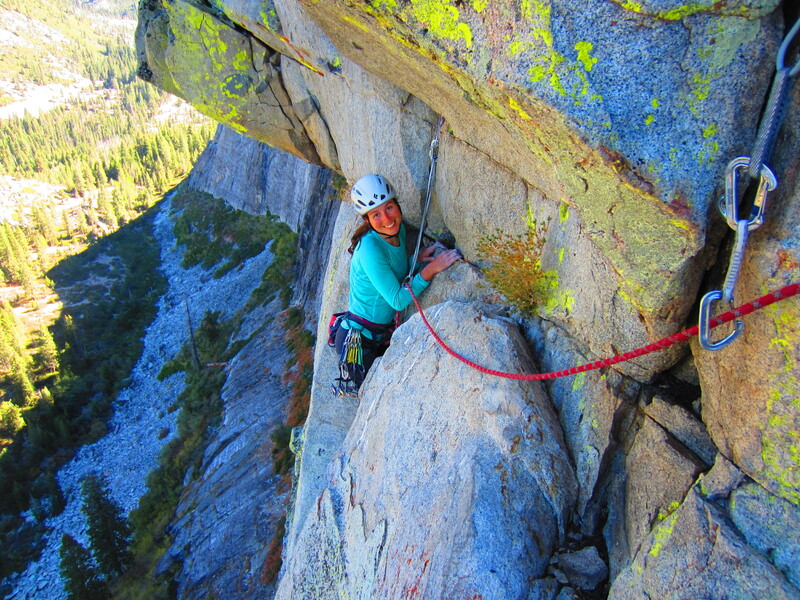 Karina following the wonderful third pitch of the Regular Route on the North Face of Fairview Dome. Famous routes can often be a let-down, but I really enjoyed this one. Having it all to ourselves certainly didn’t hurt. 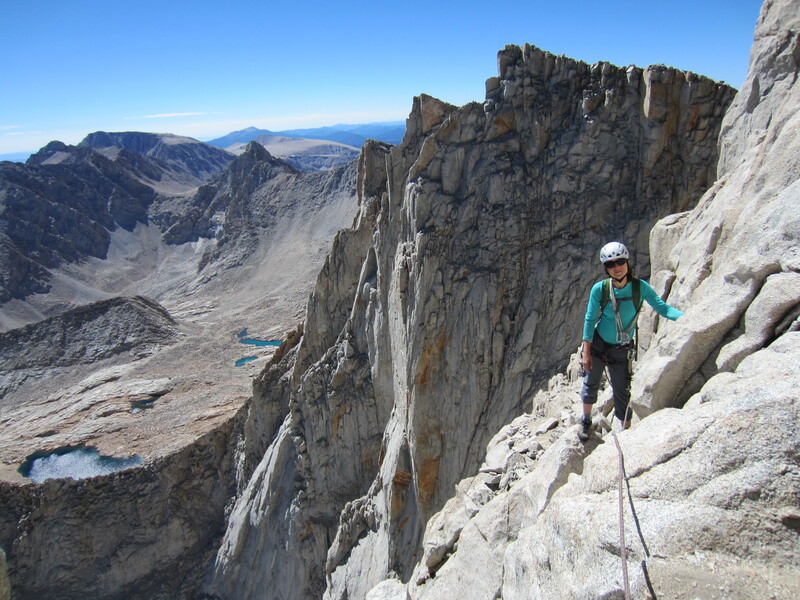 Scrambling along an airy ridge or climbing solid rock on a backcountry peak is pretty much my definition of type-1 fun (fun while it’s happening). Not surprisingly, Karina’s personal fun scale doesn’t line up perfectly with my own, so on occasion she was able to experience a touch of type-2 fun (only fun in retrospect) without which her introduction to alpine climbing would have been woefully incomplete. 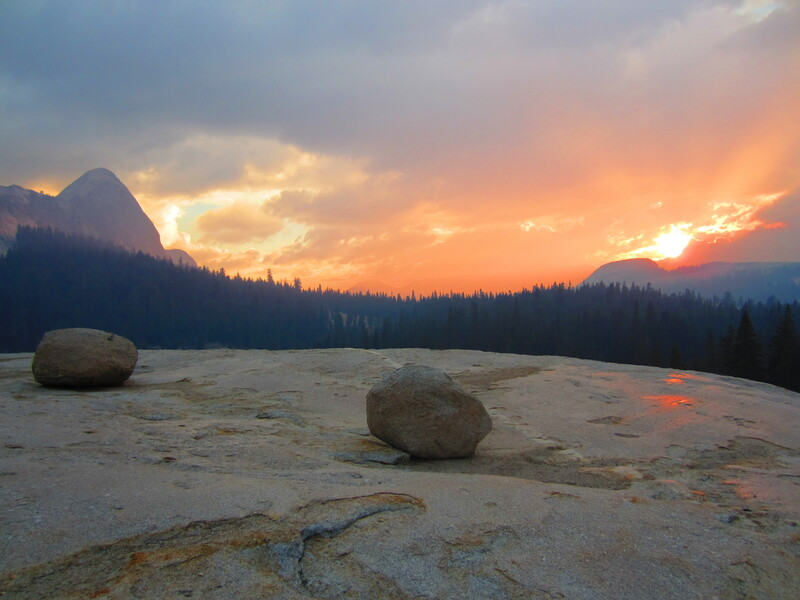 The Yosemite Rim Fire was burning nearby and smoke would sometimes engulf the Meadows. The likely long term lung damage was a small price to pay for the beautiful sunsets . 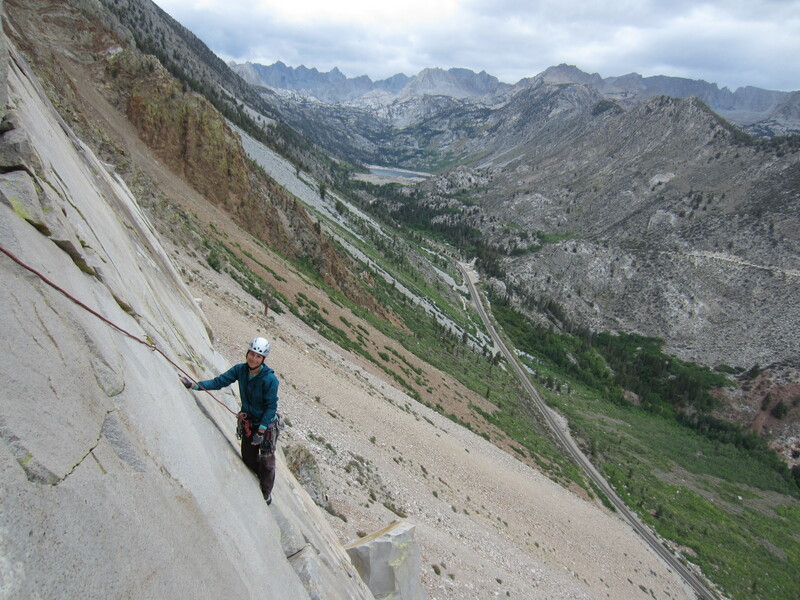 South Crack on Stately Pleasure Dome. Easy climbing on good rock with a short approach = Type-1 fun. 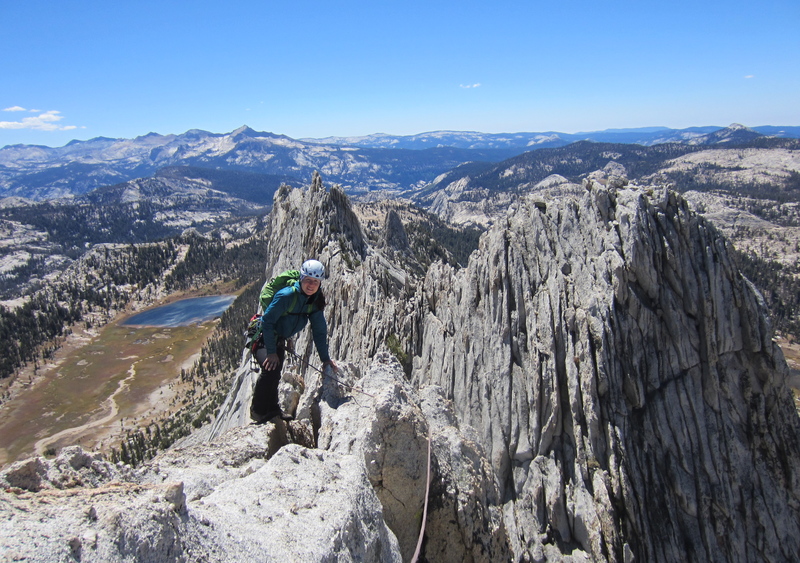 Karina on the summit of Matthes Crest. This may have been my favorite route of our trip. 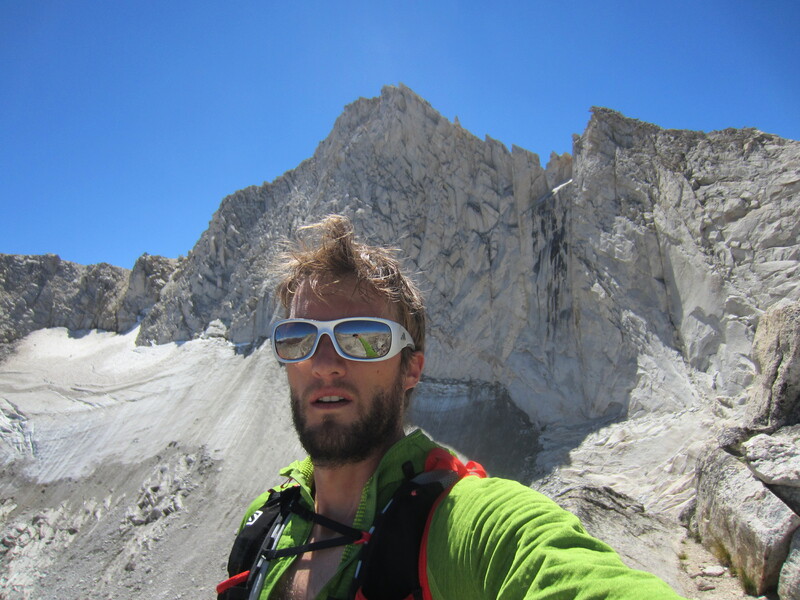 A typically unflattering self-portrait below the North Ridge (5.6) of Mt. Conness. 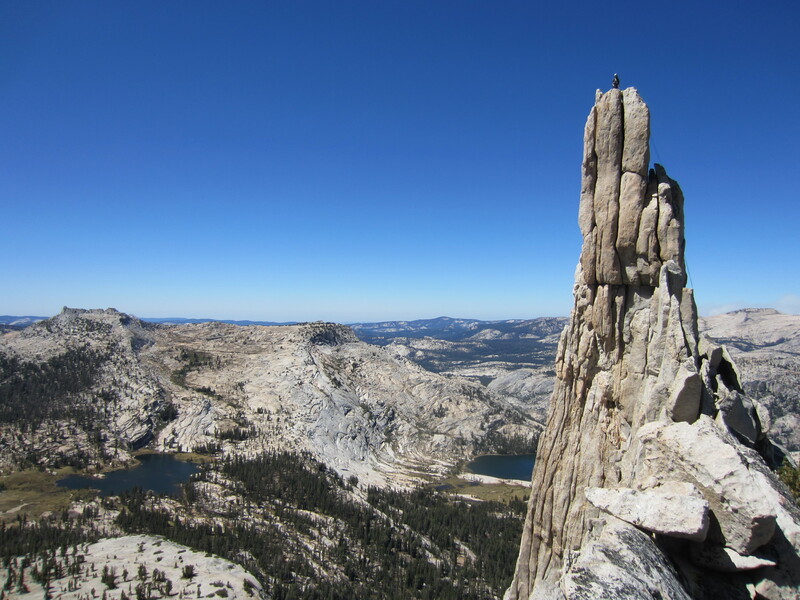 With well-maintained trails leading long ridges of solid rock, the Sierra are a great place to combine running and climbing. I look forward to returning someday to do some of the big link-ups and enchainments. 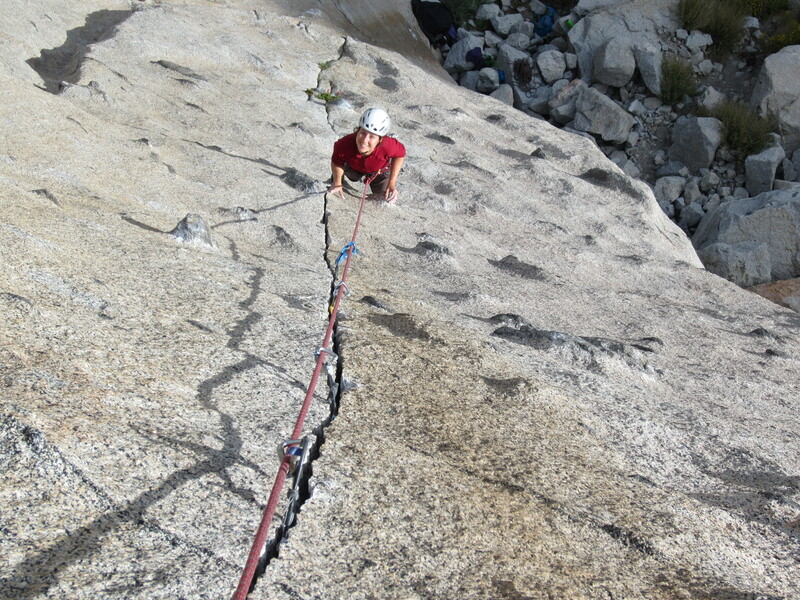 The dramatic final pitch of the 3rd Pillar of Dana. This was the day when the smoke became too much to bear. 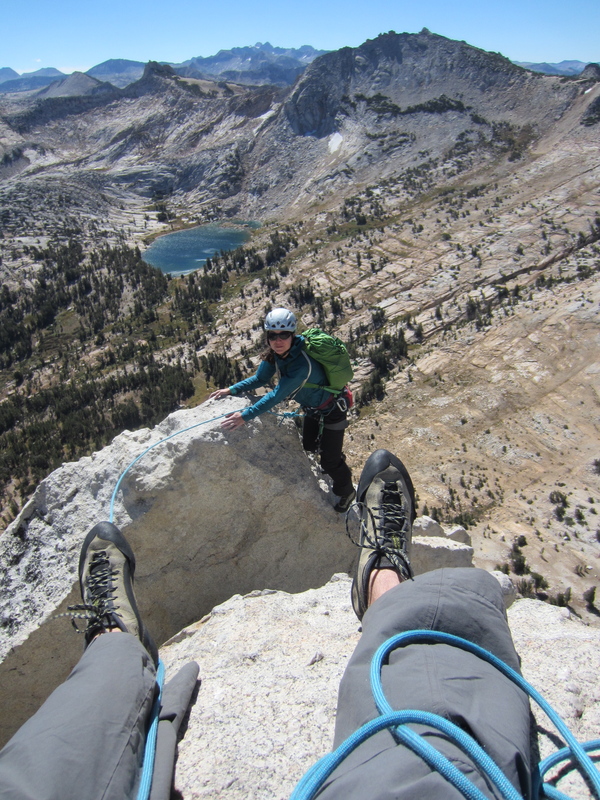 When the smoke forced us out of Tuolumne, we headed south to Bishop where an unsettled forecast kept us from climbing anything too committing. A romp up the Southeast Face of Mt. Emerson proved to be a good opportunity to practice moving quickly over easy terrain while the West Face of Cardinal Pinnacle turned out to be one of the most enjoyable short rock climbs either of us had done in ages. 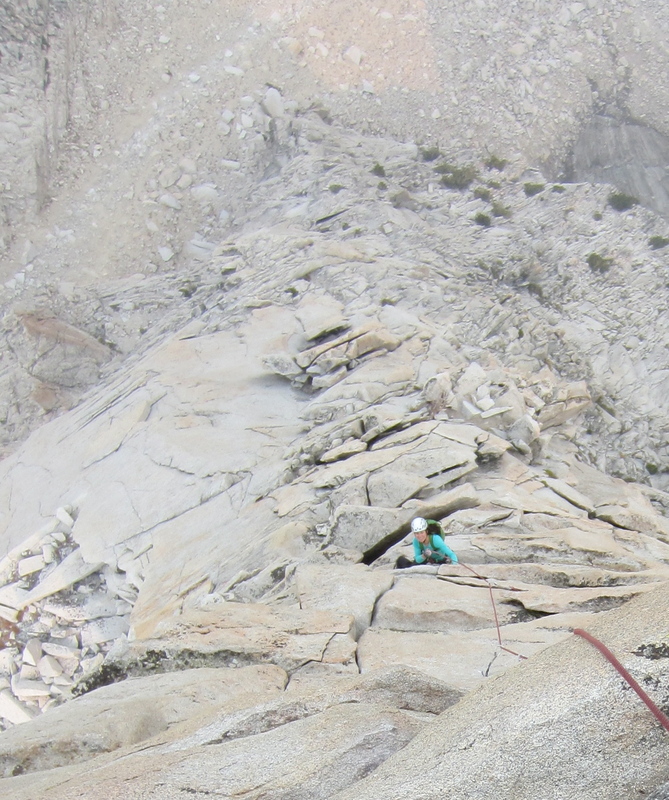 Karina soloing the Southeast face of Mt. Emerson. 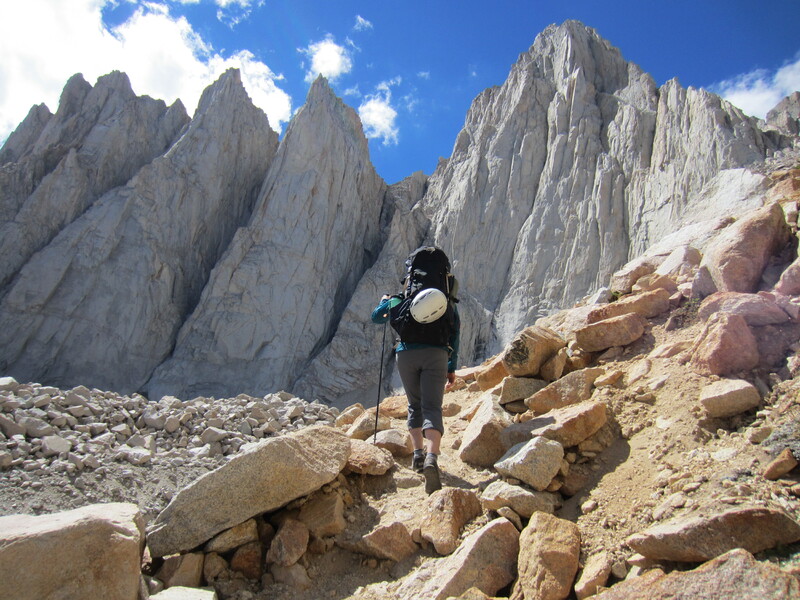 This was a pleasant route and a good chance to cover lots of ground unroped although the long descent on scree had lasting negative effects on Karina’s knees. The West Face of Cardinal Pinnacle on a day of unsettled weather. When the forecast improved, we drove south with hopes of climbing Mt. Whitney. 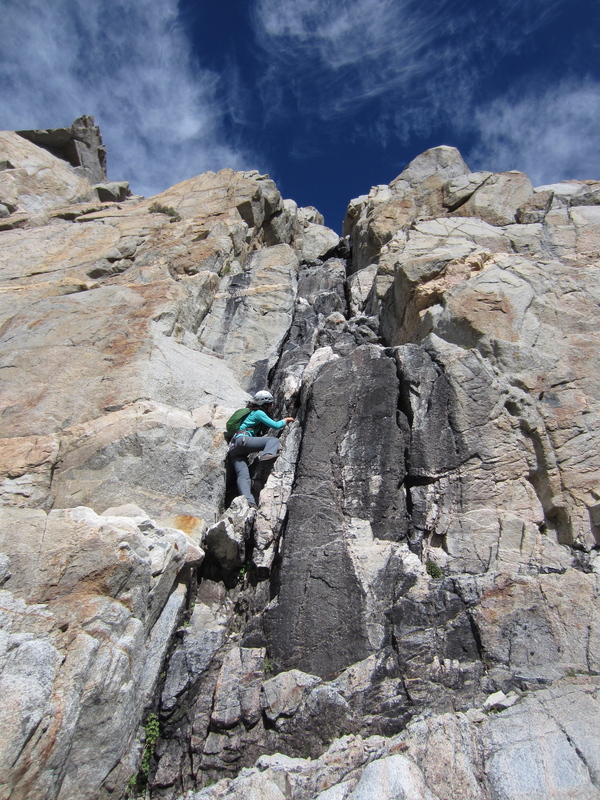 After spending the morning securing a wilderness permit, we were able to squeeze in a few pitches of rockclimbing at Whitney Portal – an wonderful and seemingly under-appreciated area. Bony Fingers in Whitney Portal. Possibly the best finger crack I’ve ever climbed. The next morning we hiked into Iceberg Lake below Whitney’s East Face and I went for quick jaunt up the Mountaineers route. Our goal the following day was the popular East Face route, so we were disheartened in the morning as numerous parties hiked past our tent in the dark while we made breakfast. Thankfully everyone was headed for the East Buttress route and by some miracle we were the first people to get to the East Face. The East Face turned out to be a very enjoyable route. As is typical of routes from the 1930s, it wanders around quite a bit in order to find the line of least resistance up the face. The rock isn’t always perfect, but then again, if all we wanted was perfect rock we would have stayed in Squamish. Karina high on the East Face of Mt. Whitney. By this time Karina was becoming a seasoned alpinist, so although we were the last party to leave the lake, we were the first to return. I even had time to scramble the delightful East Ridge of nearby Mt. Russell. With our roadtrip coming to an end, we made a final stop at Lover’s Leap where we climbed the moderate classics Traveler’s Buttress and The Line. The steep climbing on ladder-like horizontal dykes was a unique experience and a great way to end our short trip. 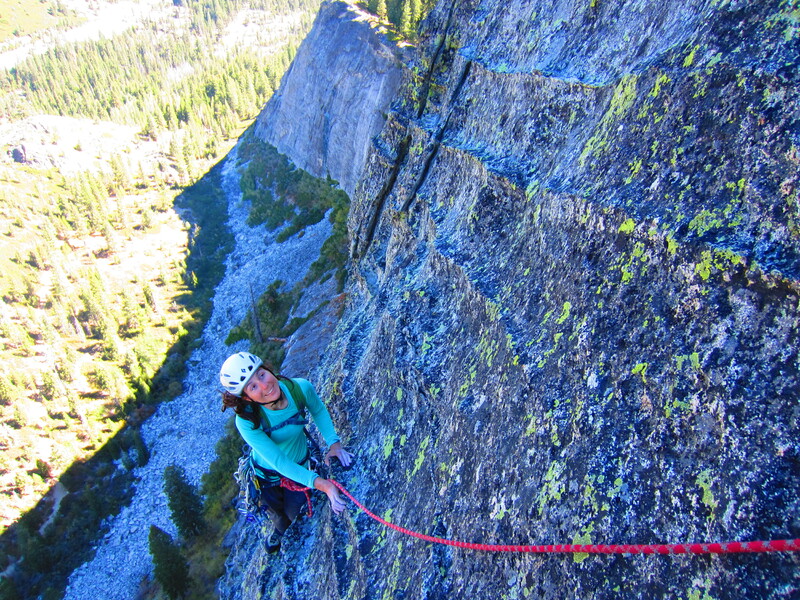 Karina on Traveler’s Buttress. I was experimenting with a mode on my camera called “super vivid”. Type-3 fun: the pleasure one gets from watching others have type-1 and type-2 fun. Terrific trip!